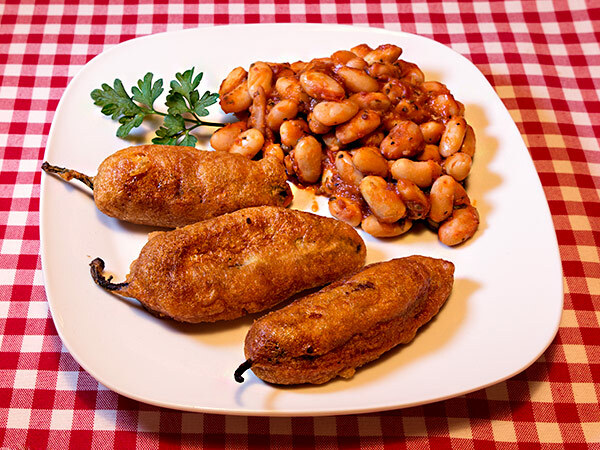 Serve these stuffed chiles as is or covered with green chile sauce and accompanied by pinto beans. 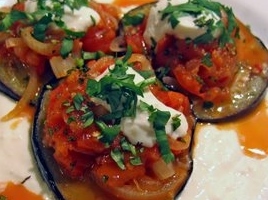 The eggplant is browned before being cooked in a spicy tomato and onion sauce, then served with garlicky yogurt. It is simply delicious served with flat bread. Cut the unpeeled eggplant into 1/2-inch slices and sprinkle liberally with salt. Leave for 30 minutes then pat dry with paper towels. This process allows the salt to draw out some moisture from the eggplant. Heat oil in a deep frying pan and then fry eggplant until lightly golden on both sides (they do not need to be cooked through—you are just adding color and a bit of flavor). You will need to do this in batches and add more oil as needed. Remove the cooked eggplant slices to a plate covered. Oil will leach from the cooked eggplant slices, so return this to the pan to reheat and then add the onion. Fry until soft. Add 3 of the crushed garlic cloves, tomato slices and red chile flakes and cook until the tomatoes break down and a sauce is formed. Add a little stock and seasoning as needed. Remove from pan. Place a layer of eggplant slices back into the pan. Top with sauce. Repeat until all the eggplant slices are back in the pan. Pour in any remaining oil from the eggplant and onion and add the remaining stock. Cover and simmer gently for 10-15 minutes until the eggplant is tender. Combine the yogurt, salt and remaining garlic clove. Mix well then spread over the base of the serving dish. Add the eggplant slices, lifting eggplant carefully to keep intact. Top with remaining sauce and onions. Sprinkle with some fresh mint and coriander for color. Note: The traditional recipe calls for chakah, which is plain yogurt that has been drained overnight. This makes it a little thicker and drier. 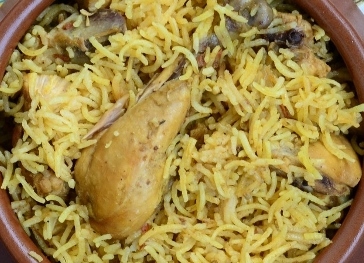 Chicken is not an everyday dish in Afghanistan, as few are raised, and they are only served at very special meals. Parts can be used, or an entire chicken. Place the chicken and chopped onion a large pot, cover with water. Bring to a boil, reduce heat, cover and simmer for at least an hour, until tender. Remove the chicken, allow it to cool, strain, and reserve the stock. Remove the meat from the bones and use only the larger pieces. 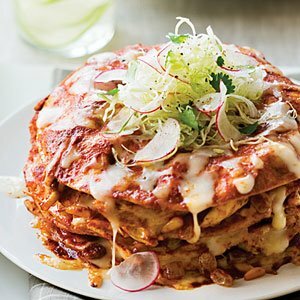 To prepare the sauce, brown the sliced onions in the shortening, remove from heat, then add the cardamom, cumin, and chile, and mash with the onions to form a puree. Add about 2 cups of the reserved chicken stock and mix well. Bring the mixture to a boil, reduce heat, and simmer for about 5 minutes. Taste and adjust the seasonings. Combine the rice, stock sauce and chicken. Place in a greased casserole, put the carrots on top in a pattern, then spread the raisins over the top. Cover and cook in a moderate oven, 325 degrees F., for about 30 minutes. If the dish looks dry, add more stock. 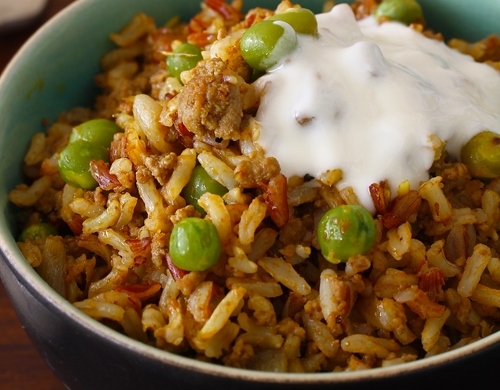 When finished, gently mix the carrots and raisins with the rice and chicken. This sauce is served over cooked rice or vegetable dishes. There is a lot of variety in each cook’s ingredients, so this is a widely used, basic sauce. Lightly brown the cubed meat, onion and garlic in the shortening. Add the other ingredients and cook until the meat is tender. Variation: Other fresh vegetables, such as eggplant, green peas, beans, or squash may be used in place of the dried peas or beans. They should be cut in small cubes, and after the meat is tender they can be added.